Our local council is trialing a new community food foragers garden. I really love the idea of this and hope that it takes off, just getting bigger and bigger. Imagine city living where on each high density living block there was a community kitchen garden readily accessible for all the locals. 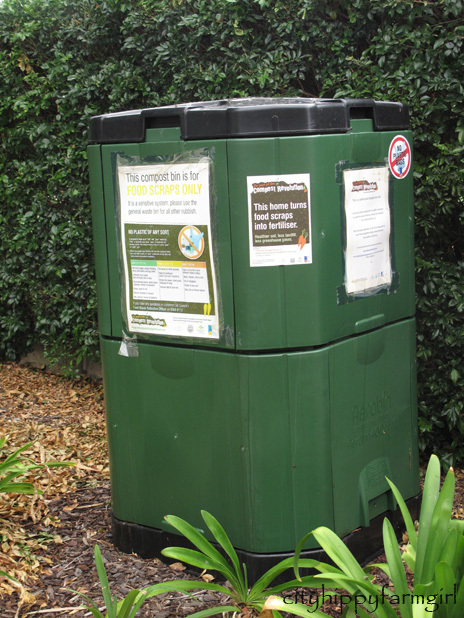 An attached community compost bin, for all those to access that didn’t have backyards. Seasonal food grown within a hop skip and a jump of where you live, with composting scraps being used for the same garden while decreasing all the food scraps being sent to land fill. It doesn’t seem like a big ask, does it? It just makes sense. Cutting back on waste having to be collected by council. Making more efficient use of space. Encouraging a community spirit. I’m sure on each block there would be at least a couple of willing people who would love to regularly tend the small edible space. If people are living in a high density living area, green spots are hard to come by and the chance to actually dip your fingers in to some soil and tend a little foliage would be incredibly appealing to a lot of inner city dwellers. More green spaces in the city are needed. Whether it be roof tops, street corners, reclaimed concrete areas, where ever they may be. However, first people need to ask for it, and be encouraging when trials are put into place. Be vocal, spread the good word. Whispered words of encouragement is what gets ideas moving. Spoken words and acts of enthusiasm keep them there. If everyone’s local councils started up just one food foragers garden in their area, it was successful, and people respected the space. Surely this could mean the start of many more to come? The benefits of a nation wide scheme like this?… Oh can you imagine. Do you have any community gardens or food foraging gardens in your area? This entry was posted in Connecting with Community, Food Glorious Food, Going Green and tagged compost, Connecting with Community, council, food, foraging, fruit, garden, green, living, local, sustainable, urban, vegetables by cityhippyfarmgirl. Bookmark the permalink. We’ll see Celia. I really hope it does too. I’ll be watching it with a lot of interest. I really hope people respect the space. How thoughtful! I hope the idea spreads. I am sold on community gardens and composting! I am going to put a compost bin down at the rental property in Virginia. Most people have been discouraging- but if I was renting a house and they had a compost bin- I would love to use it! And I hate throwing away compostable garbage when it could be made into a good rich soil. Heidi if I was renting somewhere that had a compost bin I would ridiculously happy. Add an established vegetable garden and I may never move again. I hope the new renters love it! it just makes sense!!! we’ve got one starting up in alice too. That’s awesome Sarah. I really, really hope more and more pop up. Great idea. Hope it all goes well. Fabulous idea. The Brits are light years ahead of us with allotments, community gardens and so on, I hope this really takes off. Oh, so fantastic – I’m so excited on your behalf this might be happening near you! As Rose above notes, England is much further ahead than Australia in this regard, and I suppose once upon atime everyone here had lots of space. But that certainly isn’t the case anymore, and even if we did, there are definite benefits to pooling resources and building a community focus. Is that like an allotment? Not really Misk, as an allotment is run by individuals with their own part of the dirt. This garden is run by the council and tended by them, however it’s accessible to anyone and whatever it produces to be used by the locals. A “just take what you need” philosophy. There are a few community allotments around as well. My area is a number of years wait to get in, even then it’s still annoyingly hard to get your toe in. That really sounds like a wonderful concept! A take what you need approach would encourage others to replenish it, too. An insane amount of what we throw away is food. So composting is great in my book. So good for the garden. What a wonderful idea…I do hope it works out. It sounds like a win, win situation. amen to that – I was interested that a friend of mine has an allotment that is attached to her kid’s school – had never heard of that before. Most highrise developments have to allocate space for parking – wouldn’t it be great if they also had to think about space for a community garden too. We are lucky enough to live in an area where we not only have one community garden, but 4, along with a farm to table program in schools where the kids grow what they eat, and a large proportion of our restaurants buy/grow local produce as well. The fire station has a huge compost pile that anyone can get compost from, and it is in part generated by the community garden next door. The fire station also chips old Christmas trees and distributes the mulch to local businesses who have plantings. It’s pretty cool, and I hope it works out in your area! Betsy that is awesome! If only every council made that sort of effort for their neighbourhood. Have been busy catching up on all your posts, haven’t visited for ages sorry. Love the cauliflower soup, gotta try that and the colourful post , great pics.Community gardens are amazing things. When we go to Newcastle there is one on the foreshore where there are no set plots, the rule is ,’You work in the garden and you are allowed to pick something ‘ – this simple rule for like minded people seems to keep individuals pretty honest . My favourite blogs are city blogs where people manage to create a sense of community through gardens …to me it says you can grow your own food anywhere.